If the phrase ‘luxury hotel village’ gives you pause, reserve your judgment for a moment and imagine the following: a sleek private chalet overlooking the French Alps. A lift providing direct entry to the largest connected ski resort in the world. A two-Michelin-starred restaurant. 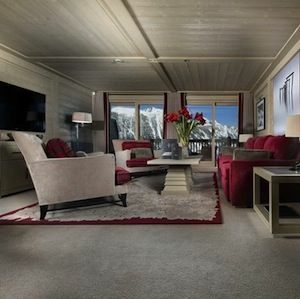 Easy access to the glamorous hamlet of Courchevel 1850, the highest point of one of Europe’s most famous ski resorts. Shall we go on? All of that is on offer at the exclusive Hotel le K2. To be fair, the K2 calls itself a luxury hotel village with good reason. The mountainside property comprises a main building and a series of suite-chalets, containing two fine dining venues, a high-end spa, panoramic swimming pool, and a futuristic kids’ club. Most accommodations are located inside the main building. For a hotel with just 26 rooms and 8 suites, there are a surprising number of room categories: the most standard version is larger than you’d expect, with a private balcony and mountain views, a king-sized bed, lounge space, a Nespresso machine, an iPad, complimentary wi-fi, a minibar with complimentary refreshments, and a bathroom with both a tub and an Italian shower. 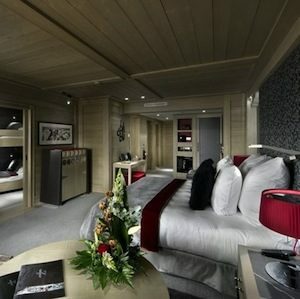 Which gives you an idea of what you might expect in the considerably more lavish (and free-standing) suite-chalets. The Suite-Chalet Baltoro, for instance, has three levels and five bathrooms, a private indoor pool with waterfalls, a hammam, a full staff, including a private chef, and complimentary afternoon tea. Did we mention there’s a champagne reception on your arrival? 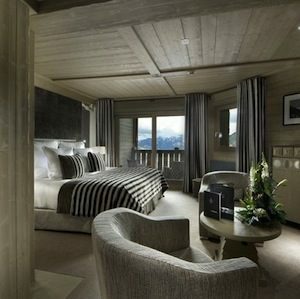 It’s a level of luxury that’s long been associated with Courchevel, a chic ski retreat in the French Alps. Which is, after all, why you’re here. The K2’s ski lift transports you into an incredibly extensive ski area that’s considered the largest in the world. Afterward, enjoy aprés-ski at the K2’s stylish Lounge Bar 8611, or in the more intimate Winston Klub, before partaking of the gourmet buffet at the hotel’s Restaurant Black Pyramid or at the Kintessence — the K2’s crowning glory, awarded its second Michelin star in 2014.